The need to archive information is on the rise, driven by content and data growth, regulatory compliance, legal discovery, and data protection requirements. The IBM® Smart Archive strategy is a comprehensive, unified, and integrated archive strategy that combines IBM software, systems, and service capabilities that are designed to help organizations extract value and to gain new intelligence from information by collecting, organizing, analyzing, and using that information. 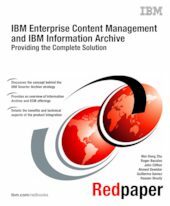 IBM Enterprise Content Management (ECM) products and offerings combined with the IBM Information Archive device provides the type of end-to-end Smart Archive solution that is a critical component of the IBM Smart Archive strategy. The Information Archive for Email, Files, and eDiscovery solution comes with the preintegrated and preconfigured Information Archive device and the preinstalled ECM software. The paper introduces technical sales people and IT specialists to the IBM Smart Archive strategy and the integration of Information Archive and ECM products and offerings. At the same time, it provides IT specialists specific guidance about performing the integrations.